TS to fill 2030 posts in Govt Medical Colleges / 931 posts in Govt General Hospitals/569 posts in Niloufer Hospital/ Government Medical College / Government General Hospital at Siddipet: TS to fill Associate Professor, Assistant Professor, Child Psychologist, Epidemiologist, Staff Nurse, Social worker, Technical Assistant, Steno Typist, Record Clerk posts in Osmania Medical College/ Osmania General Hospital, Hyderabad, Gandhi Medical College/ Gandhi Hospital, Secunderabad, Kakatiya Medical College / M.G.M. Hospital, Warangal, Govt. Medical College / Govt. 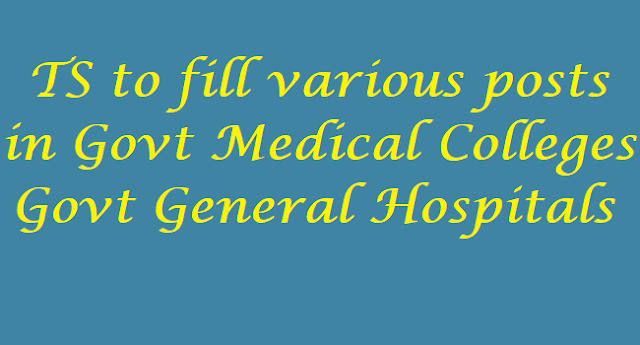 General Hospital, Nizamabad, RIMS Adilabad, Govt. Medical College/ Govt. General Hospital, Nizamabad and Govt General Hospitals/ Government Medical College / Government General Hospital at Siddipet. Government of Telangana sanctioned 1099 (One thousand and Ninety Nine only) posts in various Government Medical Colleges and Government General Hospitals under the administrative control of Director of Medical Education, Telangana as shown in the annexure to this order. 1. G.O.Ms.No.215, HM&FW (M2) Department, dated.06-10-2009. 2. From the Director of Medical Education, Telangana, Hyderabad letter No.11823/ P-2/2016, dated. 10.01.2017. 3. G.O.Ms.No.58, HM&FW (A2) Department, dated.16-05-2017. 4. HM&FW (A2) Dept., 2254/A2/2016, dated.16-05-2017. ORDER: In the reference 1st & 3rd read above, Government have accorded administrative sanction for construction of 500 bedded Intensive Care Block at Niloufer Hospital, Hyderabad. 2. In the reference 4th read above the HM&FW Department have accordingly proposed for sanction of additional posts in various categories of Niloufer Hospital in the State of Telangana under administrative control of Director of Medical Education as per the MCI norms. the orders issued in G.O.Rt.No.2246, Finance (SMPC) Department, dt.07.06.2007. 5. The HM&FW Department shall obtain concurrence of Finance (HRM) Department before initiating measures to fill up the posts sanctioned in this order, wherever service rules prescribed direct recruitment. 6. The HM&FW Department is requested to take necessary further action in the matter accordingly. Read the following: HM&FW (A1) Dept. U.O. Note No.5669/A1/2016, Dt:04-05-2017. ORDER: In the reference read above, the HM&FW Department have informed that certain Government Medical Colleges / Government General Hospitals, in the State of Telangana require certain posts to meet the increasing workload and to control the seasonal diseases, and accordingly proposed for sanction of (1099) posts in various categories for enhancement of units and faculty as per the norms of Medical Council of India and Minimum Standard Requirements. 2. After careful examination of the proposal, Government hereby sanction 1099 (One thousand and Ninety Nine only) posts in various Government Medical Colleges and Government General Hospitals under the administrative control of Director of Medical Education, Telangana as shown in the annexure to this order. 3. The HM&FW Department shall obtain concurrence of Finance (HRM) Department before initiating measures to fill up the posts sanctioned in this order, wherever service rules prescribe direct recruitment. GOVERNMENT OF TELANGANA: HM & FW DEPARTMENT – Creation of (931) posts for new Government Medical College / Government General Hospital at Siddipet, Telangana State -Orders - Issued. FINANCE (HRM-I) DEPARTMENT - G.O.Ms.No. 80 Dated: 11-05-2017. 2. G.O.Ms.No.21, HM&FW (A1) Department, dt:24-3-2017. 3. HM&FW (A1) Department, U.O.No.960/A1/2017, dt.04.05.2017. ORDER: In the reference 2nd read above, Government accorded administrative sanction for establishment of new Government Medical College / Government General Hospital, at Siddipet, Telangana State under administrative control of Director of Medical Education as per the MCI norms. 2. In the reference 3rd read above, the HM&FW Department have proposed for creation of posts in the new Government Medical College / Government General Hospital at Siddipet, Telangana State under administrative control of Director of Medical Education as per the MCI norms. Permission also hereby accorded to outsource the following multi-purpose functions in the Government Medical College/ Government General Hospital at Siddipet at a cost not exceeding an amount of Rs.23.00 lakhs per month in terms of the orders issued in G.O.Rt.No.2246, Finance (SMPC) Department, dt.07.06.2007. 5. The HM&FW Department shall obtain concurrence of Finance (HRM) Department before initiating measures to fill up the posts sanctioned in this order, wherever service rules prescribe direct recruitment. 6. TheHM&FW Department are requested to take necessary further action in the matter accordingly.